Modern Restaurant Management (MRM) magazine’s New & Notable column features new products and services as well as restaurant, food-service and hospitality company news and events. Send items to Barbara Castiglia at bcastiglia@modernrestaurantmanagement.com. Disruptive sustainable food and agriculture entrepreneurs showed the audience what the future of food could look like at FoodBytes! NYC, top photo. SomaDetect, Winnow and Wasteless took home the three top awards for their cutting-edge technologies – aiming to reduce food waste throughout the supply chain and produce better quality milk. FoodBytes! by Rabobank is a global platform designed to build lasting connections between corporates, investors and the most promising food, food tech and agtech startups. FoodBytes! NYC judges selected the winner based on product innovation, market traction, team and sustainability from the 3.5-minute pitch companies. SomaDetect, a deep learning AI dairy company, was chosen for their fiercely innovative technology that provides real-time, automated analysis of milk quality without any addition of chemicals or consumables. Applauded not only for its technology, but for its farmer-first approach and focus on quality. Bethany Deshpande, CEO, commented: "So much of our passion comes from wanting to make an impact in the food industry by helping to build a more sustainable tomorrow, and the FoodBytes! community is trying to do just that. Winning this award is exciting for us and for every single dairy farmer who has been supporting us this whole way." Voted on by the audience and Facebook Live viewers using the same judging criteria, Winnow won the People's Choice Award. As the developer of technology that allows real-time data monitoring on discarded food in commercial kitchens, Winnow aims to help businesses increase profitability while dramatically reducing food waste. From the 1.5-minute pitch companies, the judges awarded Wasteless, a dynamic pricing system that allows supermarkets to price and sell products based on expiration dates, the Highly Commended Award. Wasteless aims to prove that an innovative, intelligent and data-driven approach is needed to disrupt the food chain and reduce food waste. 3.5-minute: Ingest.ai (Food Tech), Afresh Technologies (Food Tech), Dexai Robotics (Food Tech), Winnow (Food Tech), SomaDetect (Agtech), Pheronym (Agtech), Ocean Hugger Foods (CPG), BrainJuice (CPG) and Sweetie Pie Organics (CPG). 1.5-minute: Wasteless (Food Tech), Agragen (Food Tech), Spinn (Food Tech), water.io (Food Tech), dropnostix, GmbH (Agtech), RIND Snacks (CPG), Rise Brewing Co. (CPG), Pulp Pantry (CPG), OneForNeptune (CPG), and Frecious (CPG). 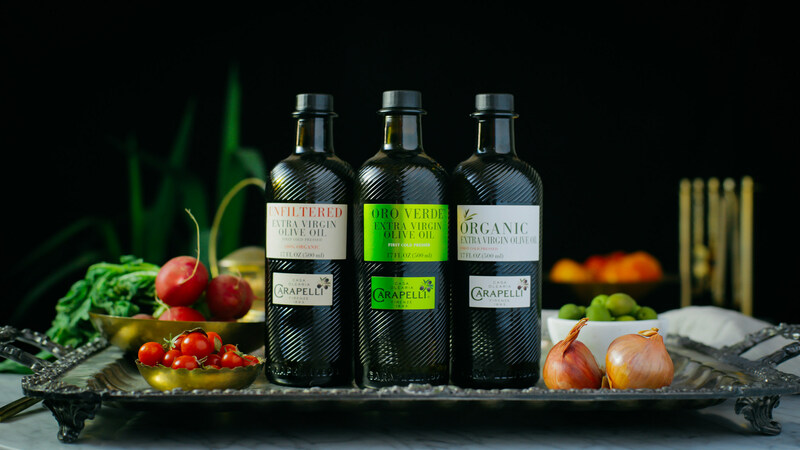 Carapelli Olive Oil celebrates its 125th Anniversary, from its traditional Tuscan roots as the first oil mill in Florence, to acclaim for its multi-award-wining product collection in 2018. "This year, we are delighted to celebrate Carapelli Olive Oil's 125th Anniversary. Quality and innovation have always been deeply rooted in our value and mission since Carapelli's humble beginnings in 1893, and our foremost commitment is to deliver the highest quality olive oil to our consumers," said Miguel de Jaime Guijarro – Chief Commercial Officer at Deoleo parent company to Carapelli. Started as a home business in Florence, Italy in 1893 by Cesira and Costantino Carapelli, newlyweds who invested her dowry into a factory and oil mill. The resulting extra virgin Olive Oil became so legendary, that by the 1940s Carapelli became the most modern food company in Italy. Now in 2018, it is the number one premium olive oil brand globally, recognized for setting new trends and innovations for olive oil — including an organic range, and unfiltered products for maximum purity and taste intensity. "At Carapelli, making olive oil is not just a process, but a form of art. And to ensure unmatched quality and flavor of the olive oils, it all comes down to olive which are carefully selected at the optimal harvest time by an olive master and treated with the utmost care to ensure the resulting oils have the most incredible flavour profiles, recognised by olive oil tasters the world over," said Miguel De Jaime. Deeply rooted in tradition and art to produce high-quality olive oils for its consumers, Carapelli's mission remains the same after 125 years in the making — to ensure the best extra virgin olive oils reach tables around the world. To honor its 100-year-history of being in the kitchen of confident female cooks, Contadina® – which is Italian for "woman in the field" – is celebrating 100 years of women in the culinary field. Contadina is supporting Cherry Bombe, the bi-annual indie magazine that champions women and food, for the launch of The Cherry Bombe 100, its inaugural list of 100 women who are making unique and lasting contributions to the food industry. The brand also tapped Hedley & Bennett, the Los Angeles-based makers of aprons, chef wear and accessories used by the country's top chefs and home cooks, to design a limited-edition apron to commemorate this pinnacle moment in time for the brand. "The Contadina logo features a strong, dedicated woman who has always been a symbol of the care the brand puts into every can of tomatoes," said Marc Fehlberg, brand manager for Contadina. "In celebrating the brand's 100-year anniversary, we wanted to pay tribute to that heritage and I can't think of a better way than by partnering with these two wonderful, female-fueled companies to honor women and their impact in the world of food." To announce The Cherry Bombe 100 and honor the women on the list, Contadina is hosting a celebratory event with its two partners at Hedley & Bennett's apron-factory-meets-event-space in Los Angeles and gifting the honorees with the limited-edition Contadina anniversary apron created by Hedley & Bennett. "When Contadina approached us about partnering on their 100th anniversary program, it felt like the perfect time to launch The Cherry Bombe 100 with their support," said Cherry Bombe editor in chief Kerry Diamond. "We are thrilled that the inaugural list has a partner that understands the importance of showcasing the contributions of women making history in the culinary field today." GP PRO’s Dixie® Foodservice spilled the beans on its soon-to-launch Dixie Ultra® Insulair™ Hot Cup, the only heat-activated disposable beverage cup that uses an internal air pocket rather than an external sleeve to help keep beverages hot and hands cool. 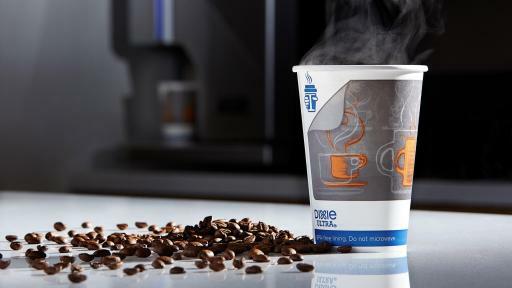 The Insulair Hot Cup is a single-wall paper cup with an interior lining made of a low-density polyethylene film. When a hot liquid is poured into the cup, a thin heat-activated air pocket expands within the cup’s lining, replacing the need for an external sleeve. The air pocket adjusts to the temperature of the beverage, meaning the hotter the liquid, the greater the air pocket. The Insulair Hot Cup is available in 12-, 16-, and 20-ounces, with actual ounces dependent on the heat of the liquid and the size of the air pocket. By eliminating the need for an external sleeve, the Insulair Hot Cup uses less material than other hot beverage cups. 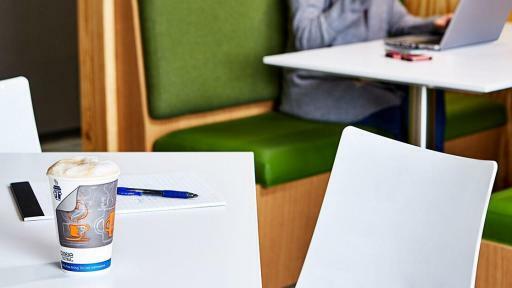 Based on a comparison of a 12-ounce Insulair Hot Cup to an average of top competitor cups, a single-wall paper hot cup and sleeve has 35 percent more material and a multi-wall hot cup has 70 percent more material, making the Insulair Hot Cup a highly sustainable option. 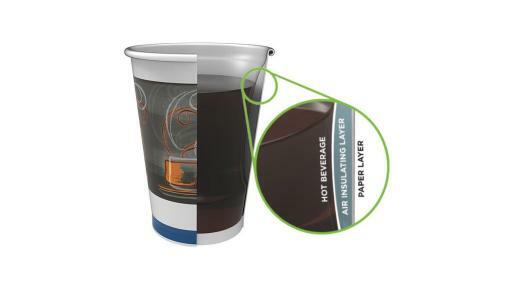 In addition, operators will appreciate that the Insulair Hot Cup requires less storage and less labor because there is no external sleeve to store; it boasts a one-size-fits-all lid; it has a lower stackable height than a polystyrene foam cup or a multi-wall hot cup; and it can be customized with visible graphics. Dixie Foodservice is currently accepting Insulair Hot Cup pre-orders, and consumers can expect to see them in limited- and quick-serve restaurants, coffee houses, convenience stores, and other foodservice establishments in the coming months. Coravin announced the global availability of Coravin Model Eleven, the company's first connected and fully automatic wine preservation system. Coravin's app, Coravin Moments™, is also available for download and enables wine lovers to discover unique pairing experiences for wines with food, music, TV, movies, and more. The app creates memorable wine moments for all types of wine drinkers from the casual wine enthusiast to serious wine collectors. Wine lovers have the freedom to enjoy bottles of wine by the glass with curated moments. The new, intuitive Model Eleven is faster, easier and more fun than pulling the cork. Users can pour a sip, a glass, or more, simply by placing the Coravin Model Eleven on top of the bottle and pressing the needle down through the cork. The light ring on the Coravin Model Eleven will turn green, indicating it is ready to pour. Then, just tip the bottle with one hand and the wine will automatically start flowing. he Model Eleven lets users set the flow rate, so they can easily pour a little to taste, a glass to enjoy, or more to share. Designed with consumer insights in mind, the new, intuitive Model Eleven is faster, easier and more fun than pulling the cork. Users can pour a sip, a glass, or more, simply by placing the Coravin Model Eleven on top of the bottle and pressing the needle down through the cork. The light ring on the Coravin Model Eleven will turn green, indicating it is ready to pour. Then, just tip the bottle with one hand and the wine will automatically start flowing. The Model Eleven lets users set the flow rate, so they can easily pour a little to taste, a glass to enjoy, or more to share. The Model Eleven connects via Bluetooth to the Coravin Moments app to make it easier to maintain and monitor usage and ensure a great glass of wine with each pour. Along with color LED icons on the Coravin Model Eleven, the app indicates the level of argon gas left in the Model Eleven's Coravin Pure™ Capsule, keeps track of needle usage and the need for replacement, adjusts speed of pour, and monitors battery life. Auto replenishment of Coravin Pure Capsules and replacement Coravin Needles can also be enabled through the app, so wine lovers are always able to pour from and preserve the bottles they love. 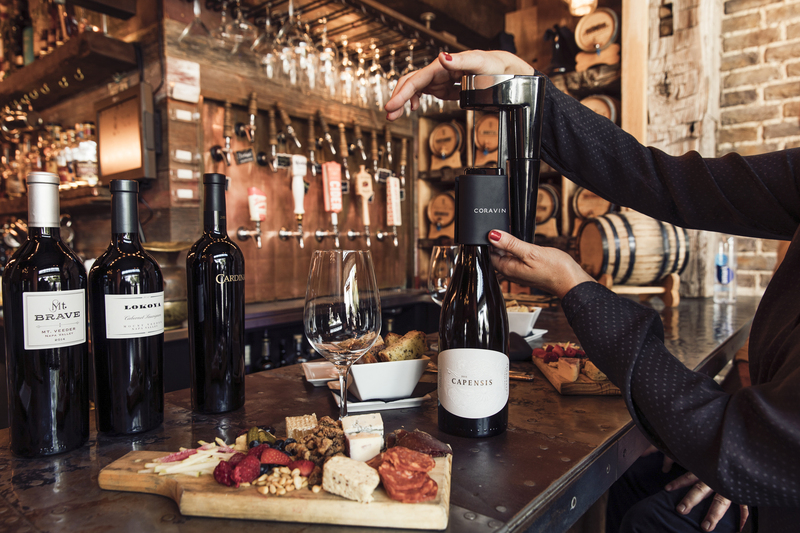 In addition to monitoring and controlling the Model Eleven, Coravin Moments includes a photo capture feature and a flavor mapping tool that can be used by all wine lovers, whether they are starting their wine journey or are wine connoisseurs, and whether they own a Coravin or not. With the photo capture feature, users can add and manage wines in their own virtual cellar. The wines are then automatically mapped for easy visualization based on their characteristics – from light to bold, earthy to fruity. Through a partnership with Delectable, the leading social focused wine app from Vinous, Coravin Moments offers recommendations on unique wine pairings for everything from food to film to music and movies. Beginning later this year, users will be able to create, edit and share their own wine moments in the App. "We've received a tremendously positive response from both the wine and technology industries since announcing the Coravin Model Eleven earlier this year, and now wine lovers will be able to experience it for themselves," said Frédéric Levy, CEO of Coravin. "The Model Eleven takes what everyone loves about our existing Coravin Systems and amplifies the experience as we continue to drive our mission of changing the way the world drinks wine." The Coravin Model Eleven launch kit comes with everything you need for a complete Coravin experience, including six Coravin Pure Capsules, enough to pour more than 90 glasses of wine. It also contains a Coravin Aerator, a set of standard size Coravin Screw Caps, a die cast brushed metal display base and a USB charging cord, all in an elegant carry case. Coravin Model Eleven is available both online and in select stores at Bloomingdale's, Neiman Marcus, Sur La Table and Total Wine, as well as at Coravin.com. The Model Eleven launch kit, valued at $1,275.65 is available for an introductory price of $999.95. The Coravin Moments app is free and available for download on Apple iOS mobile devices. An affiliate of New Water Capital L.P., a Boca Raton-based private equity firm focused on lower-middle market companies, made a growth capital investment in The Perfect Bite Co., a leading research, development and ideation firm for the frozen food industry. Founded in 2006, Los Angeles-based The Perfect Bite Co. develops innovative recipes and products for a number of prominent national grocery and club brands, as well as airlines and other hospitality companies. President and CEO Teri Valentine built the company based on the philosophy that food should be handmade from scratch using high-quality ingredients. Products created by The Perfect Bite Co. are offered in over 20,000 U.S. retail locations. Headquartered in Glendale, California, The Perfect Bite Co. is New Water's second investment in the frozen food manufacturing and ideation space, and its third investment in the value-add specialty food category within the past 18 months. New Water and its affiliates invested in Pegasus Foods, a leading contract manufacturer of frozen appetizers and snacks, in March 2018, and acquired Custom Made Meals, a leading manufacturer of fresh, oven-ready, value-added entrees and appetizers, in April 2017. 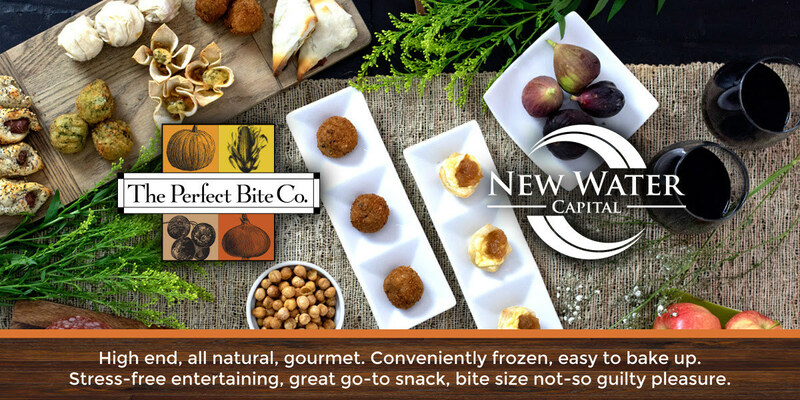 New Water Capital partner Jason Neimark said The Perfect Bite Co.'s continued focus on growing its brand, along with its ability to create innovative, high-quality products to help strengthen its blue chip customers' private-label products made it an attractive partnership for New Water. "The Perfect Bite stands out in an industry that is experiencing significant tailwinds, driven by customer demand for innovative product and greater supply chain flexibility that coincides with a consumer shift towards private-label brands," Neimark said. "We look forward to partnering with The Perfect Bite as the company continues to scale and expands its capabilities to continue to meet demand in this high growth category." "Our partnership with New Water will provide capital and extensive operational experience in frozen foods R&D and manufacturing for The Perfect Bite Company to continue its growth trajectory," said Teri Valentine. "We look forward to working with them to realize our company's full potential as we expand our team." 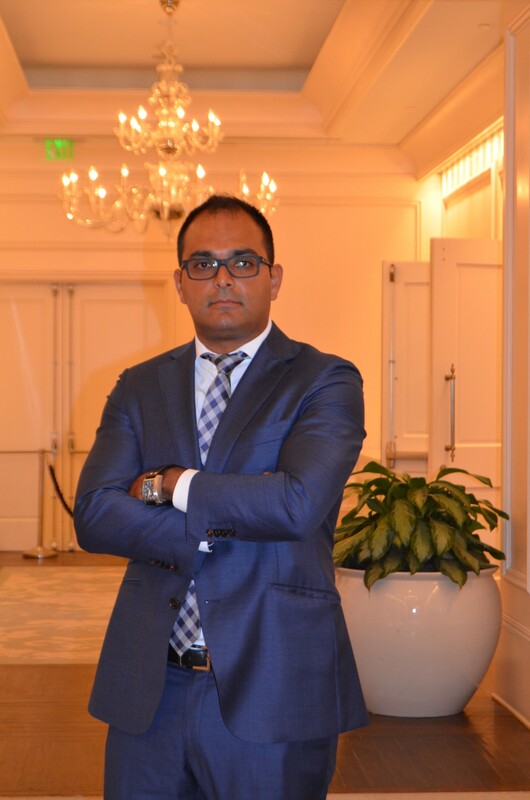 The St. Regis Atlanta, named Antonio Palomares as the director of food & beverage for the property. A veteran of St. Regis Hotels & Resorts, he will oversee all food and beverage operations for the hotel’s 151 guest rooms and suites, dining venues, and banquet and group event space. Palomares and the dedicated food & beverage team will enhance the highly-regarded dining program at The St. Regis Atlanta, which is defined by exceptional service, luxurious hospitality, bespoke beverage programs, and an impeccable culinary experience in each of the hotel’s celebrated dining establishments. Palomares joins The St. Regis Atlanta with more than a decade of food & beverage leadership experience around the country. After beginning his career as a crew member for Royal Caribbean International – one of his most valuable life experiences, as he visited more than 25 countries during his tenure – he started working at luxury hotels when he joined The St. Regis Aspen team as the food and beverage outlet supervisor. He was promoted to private dining manager on the opening team for The St. Regis Deer Valley after a year and a half, and during this time, he acted as one of the opening task force leaders for The St. Regis Bahia Beach for three months. Upon his return, he became manager of the hotel’s J&G Grill. During the past 10 years, he also had roles as assistant general manager of J&G Grill for the opening team for The St. Regis Bal Harbour; general manager of Kauai Grill Restaurant in Hawaii; and director of outlets for the opening team at Pier A Harbor House in New York. Most recently, Palomares was given the opportunity to become the general manager of Los Fuegos and Living Room at Faena Hotel Miami Beach for a year before he was promoted to the food and beverage outlets director in 2016. While working at the Miami Beach property, the hotel achieved the AAA Five Diamond Award and the coveted Forbes Five Star award within the first year of opening. Palomares also has Master Court of Sommeliers Level I and Level II certificates. He received a bachelor’s degree in Study of Tourism Management from University Anahuac Del Sur in Mexico City. “Antonio’s experience working at several St. Regis properties and luxury hotels around the country will amplify our food and beverage operations, as we aim to provide an unparalleled culinary experience for our guests,” said General Manager Guntram Merl. Argonaut Hotel appointed Gary Jones as executive chef of the property and its signature dining destination, Blue Mermaid Restaurant. Jones boasts more than 14 years of experience in various leading roles in the restaurant industry, as well as a passion for the culinary industry. 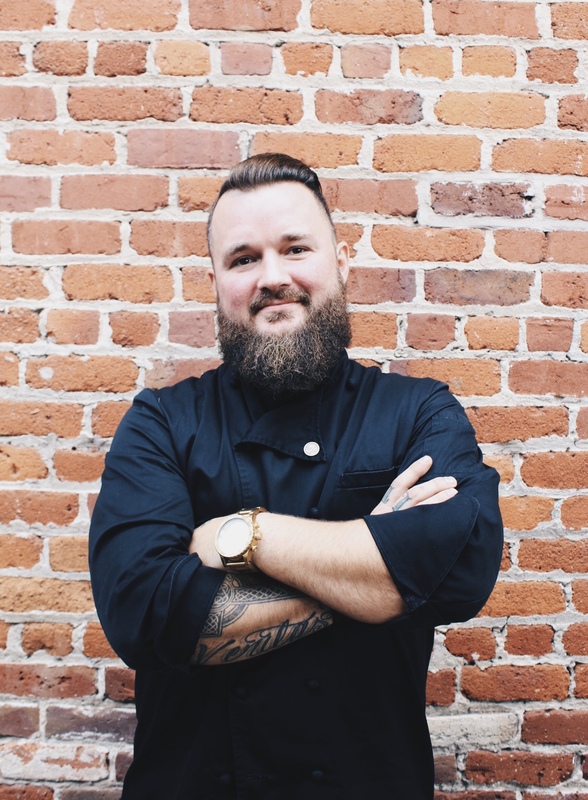 Growing up in Northern California, Jones worked and thrived in the restaurant industry since a young age and has held numerous management positions after obtaining a sous chef role at 18. Before joining Argonaut Hotel, Jones served as west coast regional chef for Special Restaurants Corporation in Los Angeles, where he oversaw all aspects of kitchen operations for multiple venues, including budget forecasting, menu design and preparation, staff training, and catering large parties. Jones was previously the executive chef at Castaways in Burbank, California for five years, managing the hilltop restaurant’s staff and menu items. In San Francisco, Jones gained experience cooking international cuisine as an executive chef at Chez Papa Bistrot for two years, perfecting traditional French dishes like cassoulet, pâté, and charcuterie. Prior to moving to the Bay Area, Jones was the executive chef and owner of Blue Flame in Chico, California for three years. He also served as executive sous chef at Delmonico Steakhouse in Las Vegas. Blue Mermaid Restaurant, which re-opened in July 2017 after extensive renovations, offers a casual, family-friendly atmosphere coupled with delicious seafood. Popular among locals and travelers alike, the restaurant’s seasonal, locally-inspired menu features San Francisco favorites, such as the award-winning Dungeness Crab & Corn Chowder, classic Cioppino, and Dungeness Crab Boil, complemented by crowd-favorites like the Blue Mermaid Burger. Blue Mermaid Restaurant also features a full-service bar offering creative cocktails with a local twist, including the Bloody Mermaid, Painted Lady, and Steph Saffron. Shortly after its renovations, Blue Mermaid Restaurant was recognized by the San Francisco Business Times as San Francisco’s #3 favorite restaurant and the #1 value-for-money restaurant. The restaurant also received a Diners’ Choice Award from Open Table in 2018. Jones’ appointment comes on the heels of Irfan Mohamed’s appointment to director of food & beverage outlets for the property, exemplifying Argonaut Hotel’s dedication to elevating its food and beverage team. 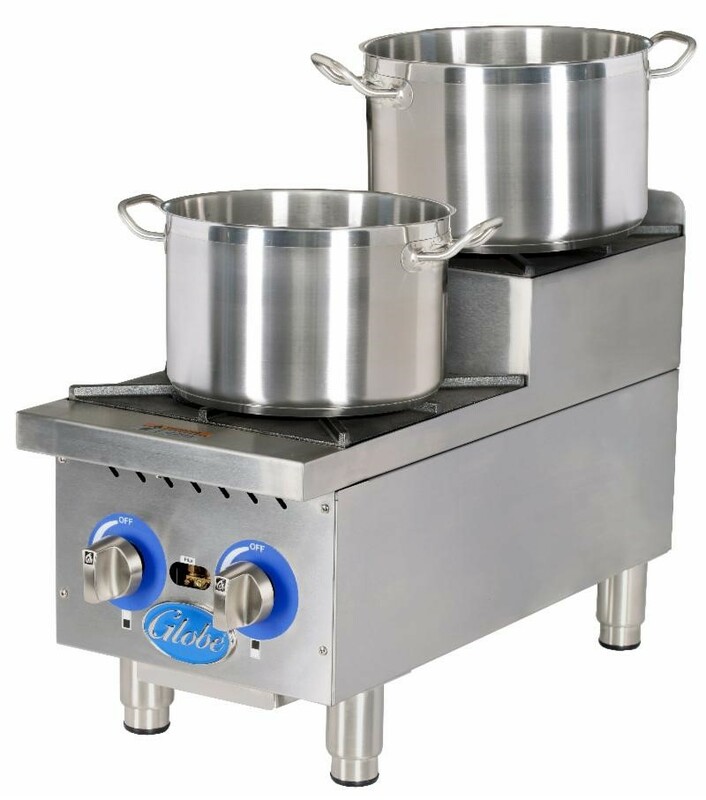 Globe Food Equipment Company continues to expand their gas offering with the addition of three step-up models to their gas hot plate line. The two-tiered units are designed for large operations, such as high-volume restaurants, to increase production and versatility. With the ability to hold and warm various items and the step-ups’ modularity, cookline space is maximized. Featuring an extended cool-to-touch front edge, heavy-duty cast iron burner grates and 30,000 BTU cast iron burners with adjustable front-access pilots. As with Globe’s current hot plate line, the step-up models feature 2, 4, and 6-burner units. All models ship set for natural gas with a liquid propane gas conversion kit and regulator included at no extra charge. JMH Premium opens the doors of its new Culinary Design Center, welcoming customers for on the bench development of custom flavor solutions. JMH Premium got its start over 30 years ago as a standard soup and sauce base manufacturer. The company has grown into one of the premier custom flavor development and manufacturing companies in the USA. JMH Premium creates products for industrial, institutional and food service organizations, with customers enjoying its premium flavors around the world. The new innovation and development kitchen features a 2,200 square foot development kitchen and pilot plant which will enable JMH Premium's world-class Research & Development team to serve its customers in an even more substantial way. The new Culinary Design Studio (referred to by the JMH Premium team as the "CDS") includes enhanced work stations, high-powered, restaurant-grade cooktops, griddle and wok stations, large capacity swept surface kettles, and increased dry and wet blending capabilities. 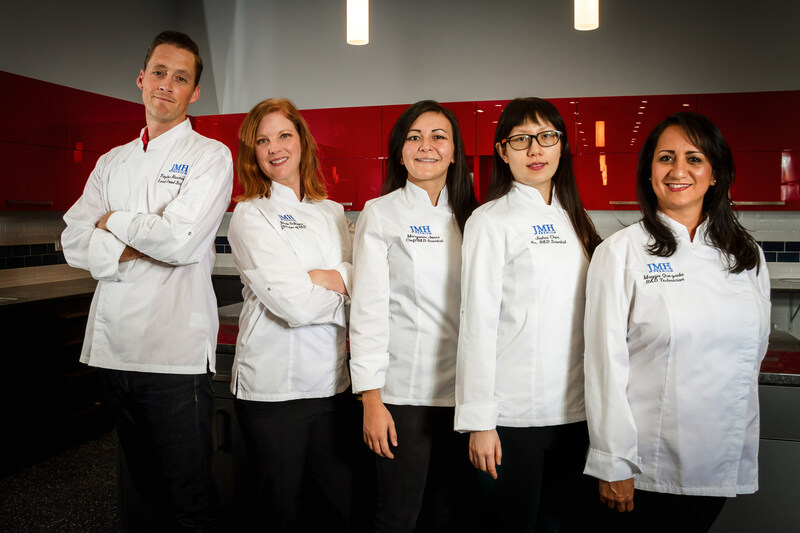 These major upgrades allow its team of Food Scientists and Chefs to take customer ideas from concept to benchtop to application to scale up, all in one space; substantially reducing the time required for commercialization. With the capabilities of the new innovation center, JMH Premium will help its customers get to a much quicker yes or no decision in their product development process. The Company can now can reduce customer development time from months to weeks or even days. JMH Premium has an impressive reputation with its customers of being able to meet stringent regulatory requirements, with the highest quality ingredients, utilizing state-of-the-art manufacturing practices, all within industry leading timelines. "This incredible new development center will enhance our ability to solve problems for our customers," said Nicole DeBloois, Director of R&D. "With our expanded work space, newly updated equipment and our incredibly talented team, we look forward to providing a better experience for our customers. They will thoroughly enjoy coming to Salt Lake Cityand working on the bench with us." "The strength and efficiency of our decomplexification process, which we call speed-scratch, helps our customers get products to market rapidly. We are solving problems like flavor and texture consistency, reducing labor costs, and even improving existing recipes when needed," added Ms.DeBloois. "We just had an incredible grand opening experience, opening our doors to customers, vendors, family and friends to experience delicious food and win greata prizes," reports Laura Guthrie, Director of Marketing. "Now that our event is finished, we will be hosting virtual tours on our website, and anyone who watches will be entered to win a great ski vacation to Utah. And all of our customers are invited to visit us and take advantage of our new development capabilities." Ultimate Baker recently launched a range of Kosher-certified naturally colored xylitol baking accessories for the diabetic market. Xylitol is an FDA approved sugar substitute that has a very low glycemic index and does not spike blood sugar or insulin. Craft blended with all-natural fruit and vegetables, Ultimate Baker xylitol is made from 100 percent plant fiber and is designed specifically for use by diabetics. 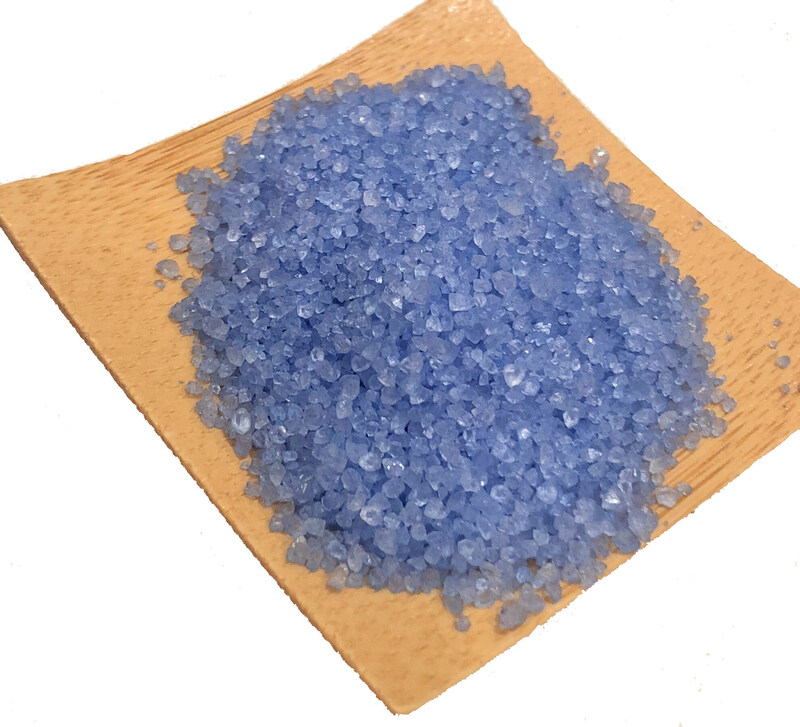 Xylitol is a natural occurring polyalcohol found in most plants, fruits, vegetables and hardwoods. Xylitol almost perfectly mimics the natural sweetness of sugar, while having 40 percent fewer calories. In addition, though xylitol is technically classified a carbohydrate, xylitol is a low-carb substance due to its minimal impact on blood sugar levels. Studies have shown that xylitol carries a glycaemia index rating of 7, as opposed to the 60–70 rating carried by normal sugar. Ultimate Baker offers a growing assortment of natural baking and cake decorating products intended for professionals and home chefs alike. An extended variety of colors, sugars, glitters, luster dusts and flour options ensures that every baking artist will have what they need on hand to perfect both baked and confectionary creations. "Our goal is to create high quality products that are both visually appealing while free of the harmful synthetics and preservatives which are dominant across the baking industry. Xylitol is a product we're just as proud to serve our families as we would all of our customers," said Sue-Ellen Cutler, VP of New Product Development. With the CDC estimating that over 100 million people now live with diabetes or prediabetes in the U.S. alone, development of safe, natural cake decorating alternatives is rapidly becoming crucial. The U.S. Department of Agriculture (USDA), the U.S. Environmental Protection Agency (EPA), and the U.S. Food and Drug Administration (FDA) signed a joint agency formal agreement under the Winning on Reducing Food Waste initiative. The agreement is aimed at improving coordination and communication across federal agencies attempting to better educate Americans on the impacts and importance of reducing food loss and waste. Signing the joint agency agreement were U.S. Secretary of Agriculture Sonny Perdue, Acting EPA Administrator Andrew Wheeler, and FDA Commissioner Scott Gottlieb, M.D. In the United States, food waste is estimated at between 30-40 percent of the food supply. This figure, based on estimates from USDA's Economic Research Service of 31 percent food loss at the retail and consumer levels, corresponded to approximately 133 billion pounds and $161 billion worth of food in 2010. Wasted food is the single largest category of material placed in municipal landfills and represents nourishment that could have helped feed families in need. Additionally, water, energy, and labor used to produce wasted food could have been employed for other purposes. Effectively reducing food waste will require cooperation among federal, state, tribal and local governments, faith-based institutions, environmental organizations, communities, and the entire supply chain. While there have been significant actions taken and commitments made through public-private partnerships to date, such as the U.S. Food Loss and Waste 2030 Champions initiative, which aims to reduce food waste by 50% by 2030, there is still much work to be done. The Trump Administration commends the 23 organizations and businesses which have joined the U.S. Food Loss and Waste 2030 Champions, including the two most recent companies – Kroger and Hilton – which joined today. There are tremendous economic opportunities and possible cost savings for businesses and individual households that can result from reducing food waste. And while businesses are a critical component of food waste reductions, consumer education is also key to the Winning on Reducing Food WasteInitiative. "An unacceptable percentage of our food supply is lost or wasted," said Secretary Perdue. "As the world's population continues to grow and the food systems continue to evolve, now is the time for action to educate consumers and businesses alike on the need for food waste reduction. I am pleased to be joined by my Trump Administration colleagues on this important, common sense issue. The future of food depends on action from us now, which is why we have established this formal partnership among USDA, EPA, and FDA." "EPA is proud to partner with USDA and FDA to enhance food recovery efforts and educate the public on the need for improved food waste management," said EPA Acting Administrator Andrew Wheeler. "Redirecting excess food to people, animals, or energy production has tremendous economic and social benefits, and that is why the Trump Administration is working closely with businesses and consumers to prevent food loss and maximize the inherent value of food." "Sadly, each day too many American families struggle to meet their nutritional needs and we at the FDA recognize the important role that reducing food waste can play in filling this critical gap," said FDA Commissioner Scott Gottlieb, M.D. "By taking steps to address obstacles that food donation and recovery programs may face in giving unsold foods a second opportunity and helping food producers find ways to recondition their products so that they can be safely sold or donated, our aim is to both reduce food waste and nourish Americans in need. We are delighted to be collaborating with our federal partners on the Winning on Reducing Food Waste initiative as we continue to explore additional ways to reduce food waste and make safe, nutritional foods available to all." The U.S. Food and Drug Administration has several online resources designed to help importers comply with requirements under the FDA Food Safety Modernization Act (FSMA). New developments in three programs established by FSMA strengthen oversight of imported foods: Foreign Supplier Verification Programs (FSVP), the Voluntary Qualified Importer Program (VQIP) and the Accredited Third-Party Certification Program. FSVP: This rule places responsibility on importers for ensuring that foreign suppliers meet applicable U.S. safety standards. The FDA has conducted over a thousand inspections and investigations under the FSVP rule since the first compliance date in May 2017. To help importers and manufacturers/processors meet supply-chain requirements, the FDA recently released a new feature of the Data Dashboard: the Firm/Supplier Evaluation Resources page under the FSMA Data Search component. This section will make it easier to find compliance and enforcement information related to specific firms (i.e. foreign suppliers). Details include whether companies have been inspected by FDA, received a warning letter, are listed on an FDA Import Alert, initiated a recall, and other compliance information. The FDA has made public a List of Participants, identifying FSVP importers and the states in which they do business, which it will update on a quarterly basis. VQIP: On October 1, 2018, the application portal opened for importers to apply for participation. This fee-based program provides expedited review and import entry of human and animal foods for participating importers. Importers must demonstrate that the foods in their application are from facilities certified through the Accredited Third-Party Certification program and complete an application providing other information. One of the benefits for importers approved for VQIP is the option to have their company publicly listed by FDA. This list will inform the public that the products are being imported by companies with a high level of control over the safety and security of their supply chains. Third-Party: The Accredited Third-Party Certification Program has established a framework in which accreditation bodies recognized by the FDA can accredit third-party auditors, called certification bodies, to conduct food safety audits of eligible entities. The certifications issued by these auditors are required for participation in VQIP; they may also be required in other circumstances to prevent a potentially harmful food from reaching the United States. The FDA has established a registry of Accreditation Bodies and Certification Bodies as a resource for importers. Panasonic System Solutions Company of North America launched a new turnkey kiosk solution that provides restaurant customers an immersive, customized, and faster experience. "Panasonic kiosks have proven that they drive a significantly higher check and that the guests using them experience an overall satisfaction similar to or greater than those placing their orders directly with staff," said Michael D. Clarke, Owner, Lickety Split Food Services, LLC, a Texas Dairy Queen multi-unit franchisee. Panasonic's end-to-end platform is managed at the enterprise level, allowing chain restaurants to deploy large installations easily and efficiently. The enterprise-grade application features full Point-of-Sale and Payment integration, a cloud-based enterprise management portal, flexible screen design, highly responsive user interface, suggestive selling, and order customization throughout the customer ordering journey. "The highly intuitive, digital user interface promotes customer engagement, increases restaurant sales and profits, and frees up staff to tend to other business needs," said M. Faisal Pandit, SVP and Chief Digital Officer, Panasonic System Solutions Company of North America. "Customers interact with kiosks in myriad venues and have come to expect that same connectivity in restaurants too. And kiosks can have a significant impact on sales and profits with transaction uplifts of 20-30 percent versus the traditional counter." Restaurant brands can have one strategic partner for a comprehensive menu of hardware choices, software, and consulting, with full deployment and after-installation services that can help scale self-ordering kiosks across an entire enterprise with speed and agility. Due to overwhelming customer demand, Kitchen CUT are excited to have launched their ground breaking software in Spanish. Part of an ambitious development plan for 2018-19, the Spanish version of the system is the second language to be released (following the successful rollout of Thai earlier this year) in a bid to make the system available to all, with other languages (including Swedish, Hungarian and German) following in the next few months. Kitchen CUT helps to transform every element of an F&B business allowing control wherever you are, with access from any device. The full Purchase-to-Pay system includes features such as Supplier Management, Allergen Tracking, Nutritional Analysis, Recipe Costing & Menu Planning, Stock Control, Wastage Tracking and Buffet Analysis among many others. The system combines an understanding of operational pressures with insightful and detailed financial performance reporting, whatever the size of your business – from a single unit, to a multi-site operation that spans different regions or even countries and languages. “We are thrilled to see the launch of the Spanish version of the system here at The Hunter Group in Gibraltar. The system itself is intuitive to use, but we were occasionally encountering a barrier when it came to our staff not having English as their first language. Transitioning the system from English into Spanish couldn’t be simpler – the team simply login, and select it from a drop down menu and can instantly access the Spanish version of the system. PreGel America has expanded its ServIce® line of equipment, serveware, and supplies for frozen dessert and pastry, with the addition of Gelato Top Ice by Italian mold producer, Pavoni®. These decorative silicone molds provide a modernized appeal to authentic Italian gelato, adding new depth to a longstanding tradition of exceptional artisan presentation of the specialty frozen dessert. As leaders in innovation in the specialty desserts industry, the company is excited about the modern designs these new Gelato Top Ice molds offer, and how much intrigue they can bring to a gelato case. "With new Gelato Top Ice molds, we are providing the necessary resources that allow our partners to wow their customers at first sight," says Anna Pata, director of sales & marketing, PreGel America. "Through this initiative, we are taking innovation into the presentation and display aspect of artisanal desserts," Pata concludes. Gelato Top Ice – Iceberg – PAVTOP100: Replicating the crystal-like peaks of a natural iceberg, this silicone mold adds a delicious 3D effect to specialty frozen dessert with little effort. Gelato Top Ice – Tablet – PAVTOP101: This silicone mold creates the visual effect of a chocolate bar that can be enjoyed in cubed pieces of perfection. Effortlessly add another layer of delicious dimension to gelato pans. Gelato Top Ice – Coral – PAVTOP102: A decorative silicone mold that creates the eye-catching illusion of a coral reef surface. Perfect for adding creativity and undeniable texture to pans of gelato. Gelato Top Ice molds are utilized with PreGel Pino Pinguino® cold fudge sauces to add a unique and decorative layer to flat gelato pans. PreGel Pino Pinguino® cold fudge sauces are available in seven delicious flavors including: white chocolate, caramel, lemon, dark chocolate, orange, chocolate hazelnut, and salted peanut, allowing for chefs to mix and match gelato and Pino flavor profiles as well as color schemes. Unified Brands added a new product series to its Power Soak line-up. The new "Power Soak Intro" is a continuous motion pot, pan and sheet pan washing system, delivering consistently clean results with improved sanitation and workforce efficiency. The unit offers an enhanced solution to warewashing that replaces the standard three-compartment sink. It is available in four standard-length models. "Power Soak is well known for their custom warewashing solutions, chosen by many of the industry's top chains, institutions, and retail operations for operational efficiency, reduced labor costs, and improved product quality," said Clay Thames, Product Line Director – Cooking & Warewash. "The development of the Intro series rounds out our product offering by providing a lower-cost solution for those operators seeking to replace the labor-intensive method of hand washing, but needing an economical alternative to the three-compartment sink." Upgrading from the Intro model, Power Soak also offers Advanced and Unlimited product platforms – providing additional options, features and benefits, as well as fully customizable solutions and layouts. 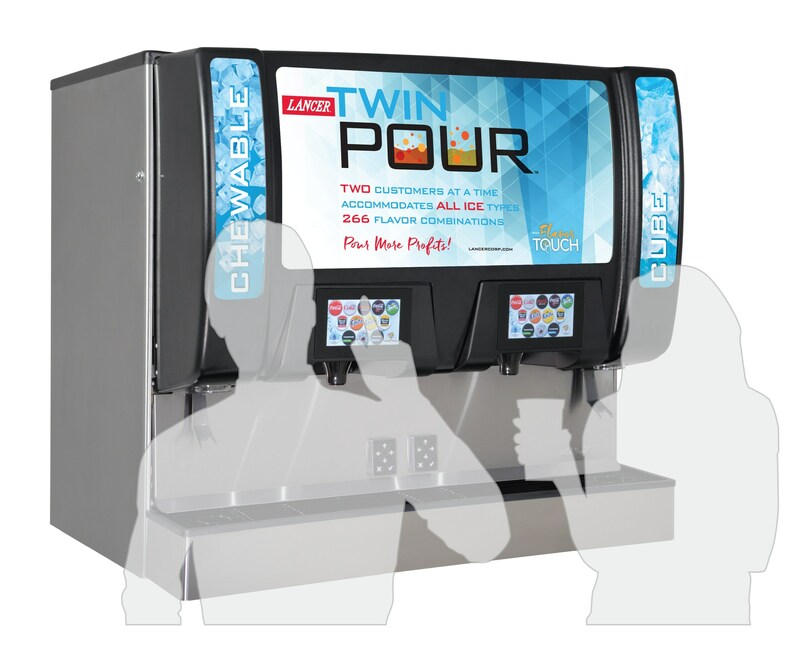 Lancer Corporation debuted their newest beverage dispenser, TwinPour, at the NACS Convention in Las Vegas. The TwinPour serves two customers at a time from its two dual-dispensing areas, each with their own ability to pour custom flavors and ice. Lancer's TwinPour accommodates all ice types, and, with 24 beverage brands and eight bonus flavors, customers can choose from over 266 flavor combinations. Lancer's FlavorTouch™ technology allows customers to utilize both pour points at the same time, with minimal steps, for better speed of service and premium product quality. "It's a new era at Lancer and our new TwinPour is the first of many compelling innovations we will be bringing our customers and their consumers," says EJ Morrow, recently appointed President of Lancer. "Fountain-dispensed beverage sales are a critical part of our retailer and foodservice customers business model. TwinPour enables them to maximize and optimize 44 inches of counter space, increasing customer throughput with two complete dispensing stations in one dispenser. Our legacy and leadership in the category will only get stronger." The 44-inch TwinPour serves twice the number of customers in less space than traditional beverage dispensers. This allows customers to get their beverages twice as fast and operators to generate more profits in less retail space. Lancer's Multi-Valve Technology has a faster flow-rate and valves can be serviced independently, even though they are all within one dispenser. TwinPour is made from heavy duty stainless steel construction and provides 30 inches of LED lite space, or you can upgrade to a 32-inch LCD merchandiser monitor with full HD video capabilities. Lancer's TwinPour is durable and user-friendly for both the customer when pouring beverages and the operator when servicing the machine. 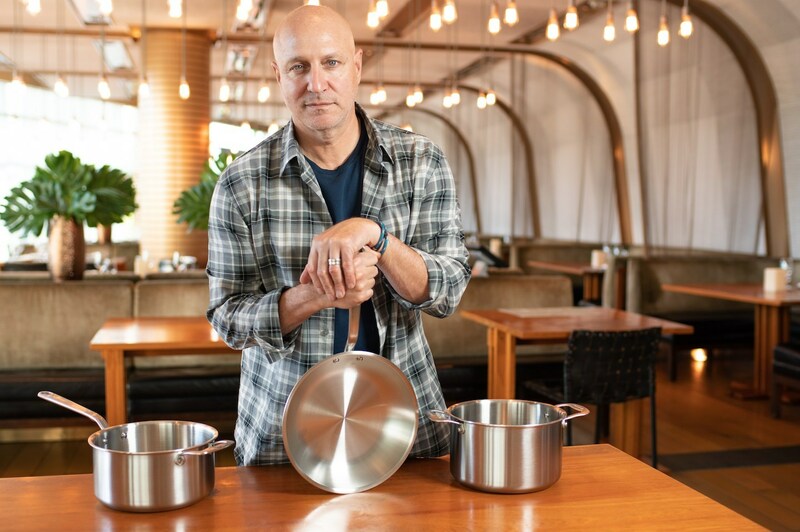 Made In, the direct-to-consumer cookware company , announced an investment from prolific restaurateur and TV personality Tom Colicchio (Bravo's Top Chef Executive Producer and Head Judge, Chef/Owner of Crafted Hospitality). His decision to invest in Made In is due in part to his admiration for businesses that are changing the way people perceive food. In addition to an investment, Colicchio will spearhead the brand's Advisory Board where he will offer council in respect to new product launches, production and educational content. He is joined in his support for Made In by KarpReilly LLC, a private equity firm noted for backing other prominent food and lifestyle brands. "What Tom Colicchio has done for the progression of cooking and food culture can't be overstated. We share his approach to building authentic brands and he fits right in with our team," says Made In Co-Founder Jake Kalick. "We couldn't be happier with the partnership." Made In is one of the fastest-growing companies in the direct-to-consumer cookware space delivering quality, thoughtfully-constructed kitchen tools at an approachable price point. Since launching nationwide just one year ago, the company has accomplished meteoric growth with a multi-million dollar run rate. This exciting milestone coincides with the closing of the latest investment round. "I've been approached by a ton of cookware brands over the years, but Made In truly stands out from the pack. Their mission to supply quality cookware at approachable prices is undeniably authentic, and they execute on every level from the thoughtful sourcing of materials to the masterful finished product," said Colicchio. "I was so impressed with the cookware that I've stocked my home kitchen with it, and will be outfitting my upcoming New Yorkrestaurant with Made In products as well. It's rare to find kitchen tools so well-suited for both professional and home applications, and I'm excited to join the Made In team as an advisor and investor in the brand." "We're very excited to have a chef as well-respected as Tom Colicchio join Made In and acknowledge the effort our team has put into building the brand and our products," added Made In Co-Founder Chip Malt. "His passion for quality and technique fit perfectly with our brand strategy, and he'll be an asset to helping Made In become a major player in the home space." With Made In, Colicchio is advancing a message to the home cook by showcasing the craftsmanship of cooking through the importance of tools. In this next quarter, Made In will expand upon its integrated educational platform, offering home cooks a crash course in topics ranging from cookware selection to recipes and techniques, utilizing its brand new test kitchen to further engage its community. RHI Solutions now represents Ice-O-Matic in the states of Oregon and Idaho. RHI Solutions is a manufacturer representative company in the foodservice industry. They provide solutions to restaurants, hotels, and institutions through the manufacturers they represent. RHI solutions focuses on selling value, expertise, and experience in foodservice equipment and supplies. “RHI has been representing Ice-O-Matic in the Washington & Montana markets for 3 years and have grown the Ice-O-Matic business through distribution. We are adding the Oregon & Idaho territory to their responsibilities to grow our business through the local distributor,” said Stephanie Wall, Regional Manager for Ice-O-Matic. Ice-O-Matic is a Denver-based manufacturer and global supplier of ice-related products and the world’s largest producer of ice evaporators. Ice-O-Matic is dedicated to providing innovative, reliable and energy-efficient ice solutions including ice machines, storage bins and dispensers. Specialty drinks—like frozen fruit beverages, gourmet tea slushies and icy hot chocolate—are an excellent way for quick-service restaurants (QSRs), gourmet coffee shops and other retailers to increase store traffic and profitability. But some frozen beverage machines can be inefficient, bulky and labor-intensive. What's more, not all are easy enough for staff to operate, or attractive enough to feature in front-of-the-house areas. Curtis has solved that problem with the introduction of the Chill-X Frozen Beverage Machine. The Chill-X is part of the expanding line of Curtis frozen beverage machines designed to help operators serve up the big, bold, tantalizing flavors that are guaranteed to draw people in. Sleek and versatile— with zero clearance side-to-side, Chill-X looks great, works hard, and slips easily into any counterspace in spite of its large three-gallon bowl capacity. It also comes with features that make it easy to consistently dispense an ever-changing variety of drinks day after day, hour after hour. A self-refill function saves operators significant time and labor. Digital temperature controls expand offerings to include delicious dairy-based drinks. A standby mode keeps product fresh overnight and, a built-in defrost cycle eliminates downtime during the rush and saves energy when the dispenser isn't needed. Cold brew coffee, tea, milk or juice on the menu are nothing new. But when you infuse nitrogen they become very different, highly desirable drinks that are sure to grab customers' attention. Catering to one of the hottest trends in cold coffee, Curtis has introduced its new Nitro Infuser to help operators grab a piece of the nitro craze. This simple yet highly-versatile component makes it easy for convenience stores, specialty coffee operations and restaurants add a creamy, stout-like effect to a wide variety of drink items and increase beverage sales right along with them. The Curtis Nitro Infuser produces a longer lasting drink that seems thicker, creamier and sweeter without adding additional calories. Although nitro cold brew coffee is the most popular example, inventive operators are finding many other applications for nitrogenation, including teas, juices, and beer as well. Epitomizing Curtis smart engineering, the Curtis Nitro Infuser is compact, easy to install, and features an exclusive patented design. It has no power requirements, no delicate electronics and no uncontrollable ball valves. Plus, its stainless steel construction and simple design makes cleaning a breeze. The three channel unit provides support for three dispensing taps. Individual precision controls enable operators to offer different nitro-infused drinks at once, dial in just the right amount of infusion, and serve up beverages with better cascading—up to two minutes—for a beautiful presentation and incredible taste. Operators just need bottled nitrogen and a tap system. It fits all kegerators. And no additional regulators or pumps are required.